My booth, STYLE REVIVAL, at the Antiques Market on Coleman is now open! 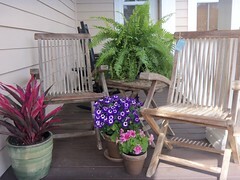 This week I am featuring a 3-piece outdoor Teak Set for $190…just in time for spring. The table and two chairs fold up for easy storage. This would look great on a porch, deck or patio. My booth is along the far left wall, third from the end. Please enjoy browsing my collection and hopefully get inspired!